Discussion in 'W.I.S.H' started by PollyannaMom, Apr 30, 2018. I have been super busy for the last week with work and at home. I have managed to get a lot of time in. Lots of just finding 10 minutes here and there. Things at home are slower this week until Saturday when we have DS Karete, baseball pictures, baseball game and soccer game and DD has a soccer game all by noon. Work, well that won't slow down now until about September. Only 2 more weeks of school and life will be easier for about 2-3 months. Just 15 minutes for me yesterday, 280/600. Congrats to piglet1979 on reaching Figment Purple!!! +25 from Monday and +15 from yesterday. Edit to add another 40 minutes from today walking to lunch and back. 25 minutes for me, and I'm also purple. Team totals stand at 3,756 (43%) and we're 634 minutes from team purple! We're half way to the weekend already, and off to Disney's Hollywood Studios! Our first abandoned idea is "Mickey's Movieland" - which would have been (on the outside) a replica of Walt & Roy's first real studio and (on the inside) an attraction about the history of filmmaking, with vintage Mickey Mouse clips, equipment exhibits, and audio-animatronic characters. P.S. - Has anyone seen lovesmurfs or GrandAmiralStrife around the boards? I haven't had an update from either of them since the first week. sorry for not checking in, kinda got sidetracked with work, kid, and then being sick for a week. Looks like I was close to 500 before getting sick last week, and just did 110 today walking (5 miles in 75 temps at 8am eewwwww) so we'll round down to 600 for the month. Got 2 weeks to make up the lost ground! Welcome back! - Sorry you were under the weather, and glad you're feeling better now! 600 brings you straight up to orange (and only 100 minutes from purple)! I have a whopping 10 new minutes myself, for 315/600. Team total is currently 4,311...which is about 500 minutes shy of pace, but only 79 minutes away from the halfway mark!! I think we'll make purple tomorrow. The Copperfield Magic Underground was supposed to open in the summer of 1998, and be an immersive dining experience where guests would see (and in some cases participate in) some of David Copperfield's magical illusions. The DHS location was to be the second in a chain, with the main restaurant in New York, and more to follow in other locations. But getting the illusions just right in a restaurant setting - with views from so many angles - proved extremely difficult, and construction costs in New York spiraled out of control. The plan there folded, and Disney backed out as well. +90 from yesterday and today. Congrats to Elizabeth Smith for reaching Flora Pink, and to Team May for reaching Figment Purple!! 30 new minutes for me (345/600) and congratulations to Twilight Sparkle on reaching Flora Pink!! Tonight's unbuilt imagineering projects are themed areas that were once planned for DHS. ...but according to "The Walt Disney World That Never Was" he hasn't quite got it right about Tower of Terror simply taking the funding from Roger Rabbit's Toontown. Apparently, there was a rift between Amblin/Speilburg and Disney/Eisner over Roger Rabbit movie sequels. As for the Muppets, we do, of course, have Muppet*Vision 3D. But sadly, a close-to-complete deal for a larger Muppet area was not signed off on before Jim Henson's untimely passing in 1990. 140 yesterday, 7 mile walk. 35 minutes for me (380/600). Team totals stand at 5,196 minutes = 59% = less than 500 minutes behind pace. Go team!! And congratulations to GrandAdmiralStrife, who has reached Figment Purple!! Would you like to bring back one of the ideas listed? DHS is my least favorite park. I have no ideas. I just miss the fun moviemaking-related stuff they used to have (like the Monster Sound Show). I'm guessing 10 minutes for me. I forgot to write it down earlier. 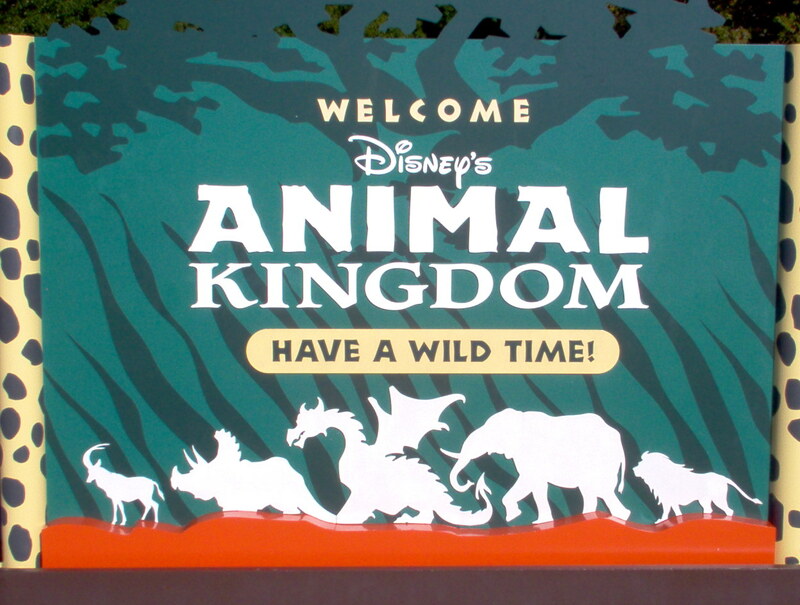 Moving on to Animal Kingdom, I'll start big. - Have you ever taken a close look at the sign? See the dragon in the middle? I am still here tracking my time. I just realized it has been a week since I posted. This darn work is getting in the way. We have been super busy. I am hoping for it to slow down in June some but I doubt it. September is when things really start to slow down at work. And home live isn't any slower. The kids keep us super busy with activities. We do get a break this weekend as we have a wedding to go to on Sunday so the kids are staying the weekend at my in-laws. So here are my times for the week. Total of 370 minutes for the week. The next 2 days I will get a ton of minutes. I will be going to the zoo both days as a chaperone of the kids field trip. 5th grade (group of girls) tomorrow and 6th grade (group of boys) on Thursday. It will be fun though I am slightly worried about the the 6th grade boys. Last year I had a kid tell me he didn't have to listen to me as he was climbing on fences. Hopefully this group will be better.